(Guardian) – THE NUMBER of local council staff on six-figure pay packages has risen 14% in the last year last year thanks to inflation-busting pay rises, according to the Taxpayers’ Alliance (TPA) annual “town hall rich list“. It finds 31 senior officials earning more than the Prime Minister and 219 paid better than cabinet ministers. The average 2008/9 increase in the remuneration packages of the top earners was 5% – twice that given to nurses and teachers – despite intense pressure to rein in public spending. New rules introduced by the Government amid concern at spiralling pay and perks at local authorities came into force yesterday, forcing local authorities to publish more details. The TPA research – based on replies to freedom of information requests – identified at least 1,250 council staff getting £100,000 or more – 151 more than in 2007/8 – averaging £2,418 a week. There was also an increase in the very top pay scales, with 166 on packages worth more than £150,000 – up from 135 the previous year. It identified Kent as the county council with the most officers on six-figures sums (27) and Liverpool the metropolitan district with most (22) – although not all councils responded. Perhaps I am guilty for promoting the topic by refusing to allow the ‘Page that will not go away’ to be archived and disappear from its prime position; but two events this week have once again highlighted the Respect issue. The first was a fairly innocuous piece entitled ‘Former Canvey Soldier Wins Her Case’ – taken directly from an impartial report by the BBC; and the second concerned my own angle on the old Concord pool affair. Many more facts are yet to emerge in the case of our own Donna Rayment, about whose case against the Army the BBC report refers. But, fortunately, The Canvey Beat was first to publish locally, showing the BBC version of the facts alongside the Echo’s opening paragraph from its RSS feed. Many readers, therefore, read the BBC version before examining the Echo link or reading the printed article. I do not buy the local Echo, for reasons which readers will know. But I do follow its reporting of Canvey on its Website. Whomever wrote the piece about Donna did not provide a by-line. And that is probably because the piece was designed to curry favour with the ‘just for the money’ and ‘wretched single mums’ brigade. Indeed, its opening sentence even leads ‘A SINGLE mum…’ in preference to referring to Donna as a once-serving NCO in Her Majesty’s Armed Forces. It was an amateurish attempt to copy the Daily Mail’s angle, aimed at their sedentary armed-forces supporters whom wish they can somehow achieve, for themselves, a particle of the Fallen’s Glory from the comfort of their well-worn, civilian, armchairs. Not only did they denigrate Donna’s attempts at righting the undeniable wrong done to her, some even went so far as to attack her regiment. Tell the HAC’s Fallen that! And as to her not putting herself in harms way: she was the Commanding Officer’s driver! But Jim appears to believe that COs simply conduct operations from their own armchairs – like him. Like virtually all other contributors to the Mail’s offering, the nearest the reprehensible Jim has ever come to combat is probably changing the uniform on his beloved Action Man doll. Donna was a lance sergeant, for goodness sake. Do these (predominantly sexist) male contributors think that the Army promotes individuals to such a rank because they have a pretty face?.. Gratefully, the Echo’s piece did not generate anywhere near the wannabe-soldier-but-was-afraid-to-apply feedback that the Daily Mail’s article did. But the Echo can take no responsibility for the respect paid to Donna by its silent readers. Indeed, the Echo has form when it comes to generating public outcries against the righteous. Their coverage of the Julie Abel affair was written from their position of support for Dave Blackwell, then leader of the Canvey Island Town Council. And the paper even reported that Bob Spink, our local MP, would be appearing at the disciplinary hearing on the former’s behalf (as if this was evident proof that Julie would lose her case). But were residents informed of the Borough Council’s decision in that ‘newspaper’s’ pages? No. They were not. Respect was the theme of that second piece this week, regarding the Borough Council’s decision to fill-in the old Concord pool. In this case, there was no respect shown to islanders. And I am not referring to Tory Borough Councillors here (whom, with the exception of Ray Howard and Tony Belford, do not live on the island). Ray has already made clear that he disagreed with the CPBC decision to lump-in a decision on the Concord pool with other motions he agreed with, and then be whipped into a voting position. Tory councillors should be admonished for taking their eye off the ball; but it is the Canvey Island Independent Party that must bear the majority’s criticism. 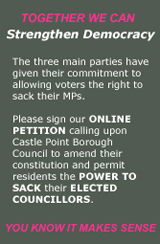 It is they who are responsible for the lack of any intelligent, political argument in Castle Point – and their entrenched opposition to anything that is Tory proposed has fatally wounded democracy in this borough. Readers will know, I hope, that I personally have no political affiliation; but that I am a strong supporter of the organised Party system, which, I believe, enables problems to be quickly resolved. I certainly have no time for a disorganised rabble with no detailed manifesto for this island or its inhabitants. Colin Letchford emailed me his report on the two seafront pools on Tuesday, and I immediately decided to publish once I had confirmed what it contained. Unfortunately, I was unable to meet-up with him until Friday morning – and only made arrangements with him to meet-up late Thursday night. I was unaware that he had also emailed the Echo. I knew the story was ‘hot,’ and was also worried that this Blog could not do it justice. So, when I saw Matthew Stanton’s piece in the Yellow Advertiser, I sent him Colin’s report to use as follow-up. Embarrassingly (for those who wish to provide documents to the Yellow Advertiser) Matthew emailed me back, saying that he could not open .docx files. Could I supply them as .jpgs? Eventually I did; but it was not until late that evening (and I was a bit peeved by having to grab various screen shots in Windows 7 and then stitch them together in Photoshop to enable a fellow journalist to do his job). Moreover, I had converted and sent Colin’s .docx files as old MS Word .docs – and provided them as an email grab. As a freelance, I work constantly in Word, and could not understand the problem. Anyway, it was late the following evening when I arranged to meet-up with Colin and verify his facts. And, as I was putting down the phone, it occurred to me that I was proposing to do nothing more than blog the story. I was not taking an active part in trying to get the problem resolved. ‘Not a good example to set your readers,’ I thought. So, despite the late hour and an early meet set for 9.00am the next morning, I decided to test my own theories on the party-political system. Normally I would have called the local MP; but, given facts revealed on this blog, I decided not to bother. I thought about contacting Pam Challis; but Collin had told me that he had already emailed her; so I thought about contacting Julian; but that would probably back-fire on me by creating a local election issue that would see the problem remain unsolved. Could I instigate a speedy resolution to the matter by calling on the one Prospective Parliamentary Candidate (PPC) whom I have constantly criticised in these pages for being too feeble to speak? Well, I was not prepared to have her hang-up on me at that late hour – and decided an email would better suffice (supplemented with a ‘you have mail’ text). I simply asked if she could meet-up with Colin and me the next morning, and sent her a copy of his report. But I received no reply. She was probably, like all sensible people at that hour, firmly asleep. I met Colin at 9:00am as promised, and we were some ten minutes into our discussion near the old pool when Rebecca Harris arrived. She did not bring a photographer; and she was completely unaccompanied. Just Colin, Rebecca, and myself. I took up observer status as the Conservative Party’s PPC immediately placed the surprised Colin at ease, and then accompanied us both around the two pools while allowing him to fully present his case. She was attentive and, from time to time, gently probed Colin’s extensive island knowledge to fully grasp the situation. Rebecca is highly intelligent, with a firm grasp of all island matters. She even knew where the Concord Cafe was (which I thought I did; only to be proved wrong – and completely unassisted by locals I stopped to ask, whom had no idea of where it was either). Fortunately for me, Colin had said he would be wearing a distinctive red coat! I am not going to turn this into a ‘he said, she said’ piece; because it would not do justice to the intelligent and exhaustive discussion I was witness to. But I will say that Rebecca identified an extremely original way in which the problem, which basically rests in a technical ‘what is Council Revenue and what is Capital Expenditure’ issue, might be resolved. This was not a PPC fighting a rearguard action over her party’s Council Members; and it was not someone trying to proclaim she could immediately solve the problem. As a mere PPC she has no power or authority; but she is in a position to mediate on islanders’ behalves with her fellow Tories and, like me, she is passionate about Democracy. I had not expected Rebecca to turn-up. I had, most certainly, not expected her to turn-up on her own (providing a non-Tory journalist with the opportunity of taking any of her candid remarks out of context or ‘quoting’ things she did not actually say). And it bothered her not one jot that Colin might have arranged to be accompanied by a troop of angry islanders to ensure his message was taken-up by this blog. The reason why Rebecca has so little press coverage is because she does not seek it. She just likes to get on quietly with matters and give them her full attention. I walked Rebecca back to her car, and she stopped to look at three plaques, peering up from the earth and uncut grass on the seawall side of the road from the council car park. The plaques were aged and weather-beaten, proclaiming the names of lifeguards that are no longer with us. When she turned around there was a tear in her eye. ‘That is so sad,’ she said. Her words resonated with me as I walked back along the seawall to my own car. They seemed to fit my view perfectly of the island’s political situation – and I was reminded of those numerous Town Council trees and plaques. Why Does It Take A 62-Year-Old Islander To Point-Out Tory Council Mistakes? Colin Letchford: "I am at present of no political persuasion. However, I am having to get involved because of the undemocratic way in which CPBC decided to get rid of the best paddling pool on Concord Beach." WHILE the Canvey Island Town Council has been bleating in the local press about how undemocratic the Tory-led Borough Council has been in deciding to fill-in the old Concord pool on Canvey’s seafront and retain the new pool to the West; and while that same Town Council has been leading residents in emotional protests designed to maximise their media coverage, one, lone, non-political, 62-year-old islander and contributor to canveyisland.org, has patiently compiled a telling dossier comparing the two pools. Without resorting to placards and demanding that the old pool be kept ‘because it has been here for 80 years,’ or ‘because it is a historical feature,’ or ‘because that’s where I learned to swim as a child,’ Colin Letchford picked-up his camera and took his young dog for a walk. What he discovered, and carefully documented, was that the new pool, which the council wish to keep, has far more associated safety problems than the old pool, which the Borough Council is proposing to fill-in. The Echo broke Colin’s story yesterday evening (spiking my own guns since I had not been able to meet Colin until today – and spiking a Yellow Advertiser follow-up to their own piece regarding similar conclusions drawn by the Canvey Coastguard). Residents should not forget that the Town Council is largely composed of Borough Councillors, whose debating skills and contribution to local government have been questioned before. So it should not come as a total surprise to find that, in order to get anything done, the ruling Conservative group have taken to making some ‘obvious’ decisions via a party whip so they can get-on with more important matters. No. It is not democratic. But neither is island politics. And, while a reasoned opposition, offering well-considered counter arguments to a ruling group’s proposals is healthy, an inflexible sword of Damocles approach, as offered by the Canvey Island Independent Party, is not. After receiving many complaints, from islanders, regarding the dangers to small children from having their feet caught in the old-pool’s surrounding walls, or sustaining injuries from rocks, which island children constantly throw into the pool, Tory councillors were of the opinion that it would be cheaper to fill-in the growing danger before they were faced with having to pay large legal damages when someone was eventually hurt. The fact is: we live in a litigious society – and Councils are by no means immune. It is inevitable that, sooner or later, the ruling Tory group would get things wrong. It is inevitable that, sooner or later, they would take their eye off the ball. Filling in the old Concord pool and retaining the lifeless concrete offering, simply because logic dictates a new pool is bound to be in far better condition than one 80 years old, was a truly dreadful decision. And the fact that it has taken a 62-year-old islander to provide a lucid, reasoned argument for retaining the old pool over the new is simply appalling. Colin Letchford is not a councillor. He holds no political office. He does not enjoy taxpayer funded expenses, nor draw any public salary. Residents might like to ask why, rather than organising public protests, which their friend Bob Spink could use to muster his local election campaign, did not one of the CIIP members pick-up a camera, and take their own dog for a walk?.. Filed under: Island focus, Politics, Updated | Tagged: Bob Spink, Canvey Island Independent Party, Canvey Island Town Council, Castle Point Borough Council |	Comments Off on Why Does It Take A 62-Year-Old Islander To Point-Out Tory Council Mistakes?